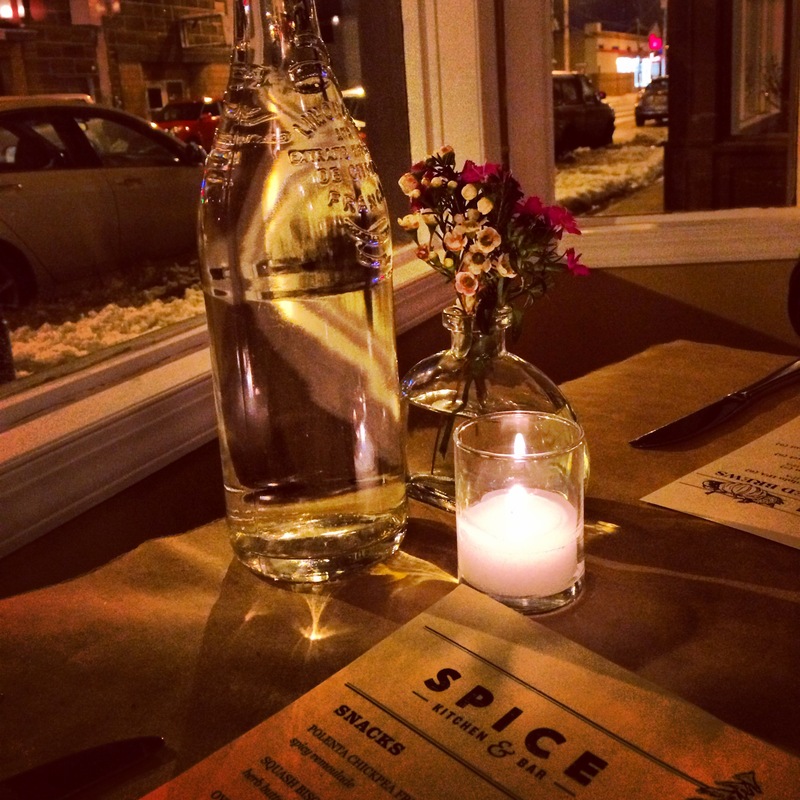 Spice Kitchen + Bar | Cleveland, OH | dreaming of the next bite. I had been aware of Spice Kitchen for a while, mainly because when I was shopping for the perfect wedding caterer two years ago, I crossed paths with Spice of Life Catering, Spice’s catering division, which at that time WAS Spice. The brick and mortar came later. While they did not end up catering our day, they did emerge as THE premier caterer in the Cleveland-Akron area, known for their creativity and use of fresh, local ingredients. They also hosted at that time (and still might) what they called Plated Landscape dinners, a gathering of foodies at an outdoor venue, where chefs prepared multi-course meals served on meticulously dressed tables in the great outdoors. What could be better? And from all this, in 2012, a restaurant was born. Spice Kitchen is as beautiful as I imagined their plated landscape dinners must have been: fresh-cut flowers at the tables, candlelight, white linens, and mason jars for water glasses. 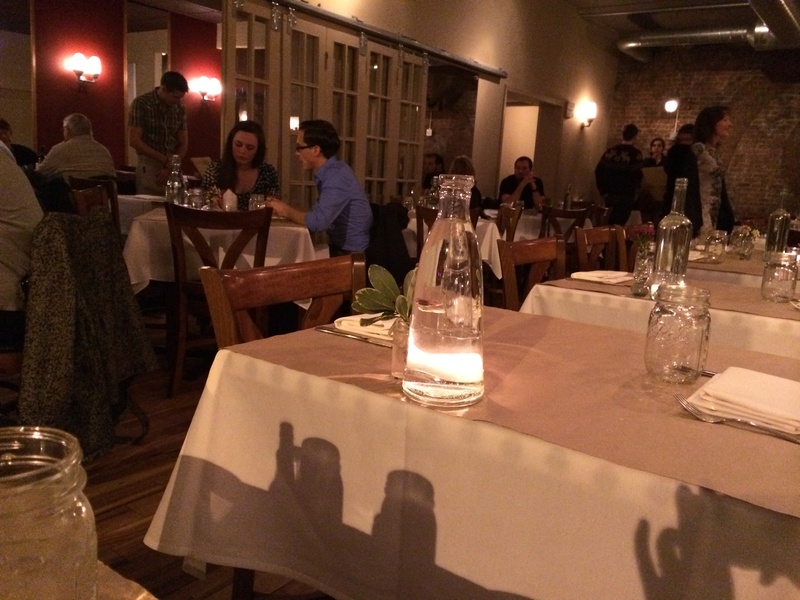 You must excuse my photos – low-lighting does not bode well for iPhone pics as we know. 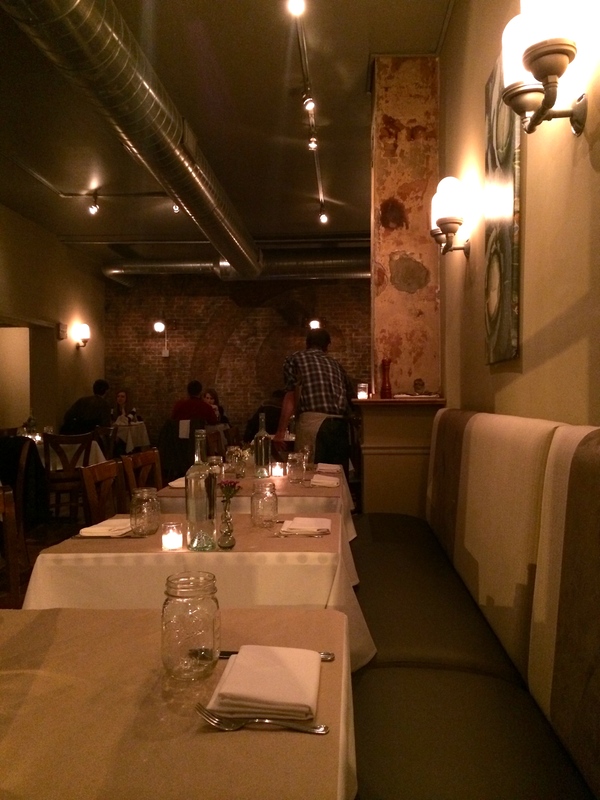 This Valentine’s eve featured an eclectic menu of meat and seafood entrees, with several items that caught my eye as we perused the website before hand. And note: before you go getting angry with me because these particular dishes are no longer available, it is quite likely that Spice is rotating their menu on a somewhat regular basis, based on what is in season and what local ingredients are available. The good news is that you’ll always get a new point-of-view with every visit. Our first course was oysters on the half shell, obviously not a local ingredient, but one I was beyond excited to see nonetheless. 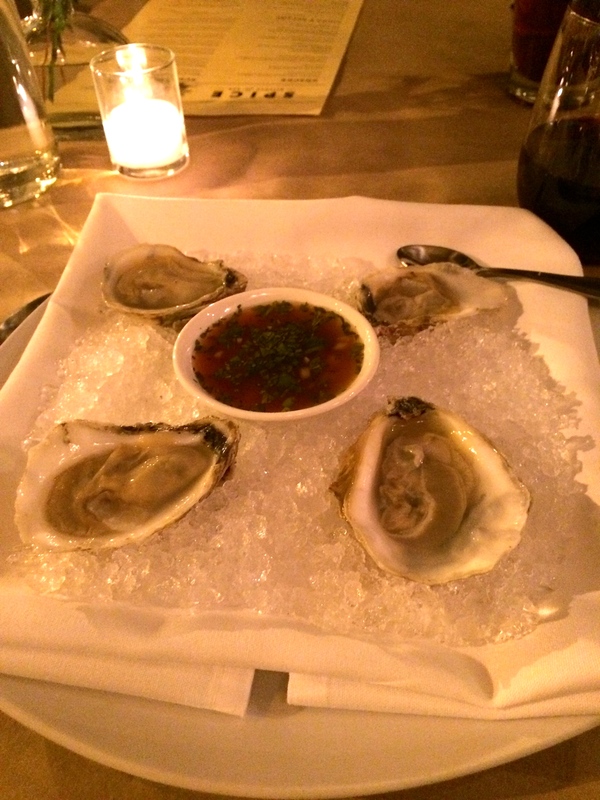 [I’m in the midst of a total raw oyster obsession lately.] These beauties were served with an apple-ginger mignonette, a tasty, well-seasoned and slightly sweet departure from how everyone else serves raw oysters. And what a lovely and unexpected departure it was. For the main course I opted for the salmon, which was on this night, pan seared and served with cauliflower puree, broccolini, and Asian relish. This dish was absolutely perfect. 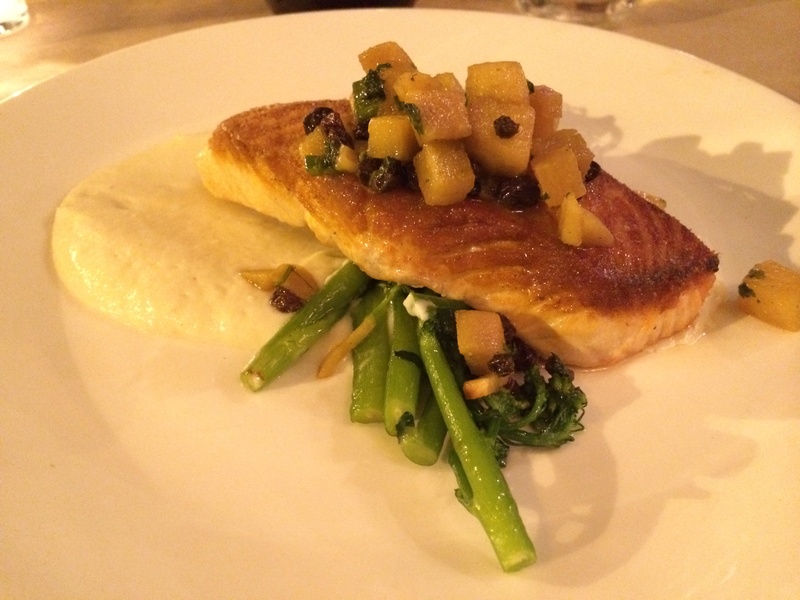 The salmon had a crisp browned top layer, but inside was cooked to perfection and perfectly soft. And the cauliflower added a buttery smoothness that completed the picture with style. Since it was a fancy occasion, we had to splurge on dessert. Well, two actually – a bit out of character for us, but we just couldn’t eliminate either of these. And, possibly the best dessert ever made: Chocolate Pana Cotta with smoked whip, homemade marshmallow, and marcona almonds. Nothing beats a delicious pana cotta, but this one soared to new heights with their outstanding interpretation of smores. 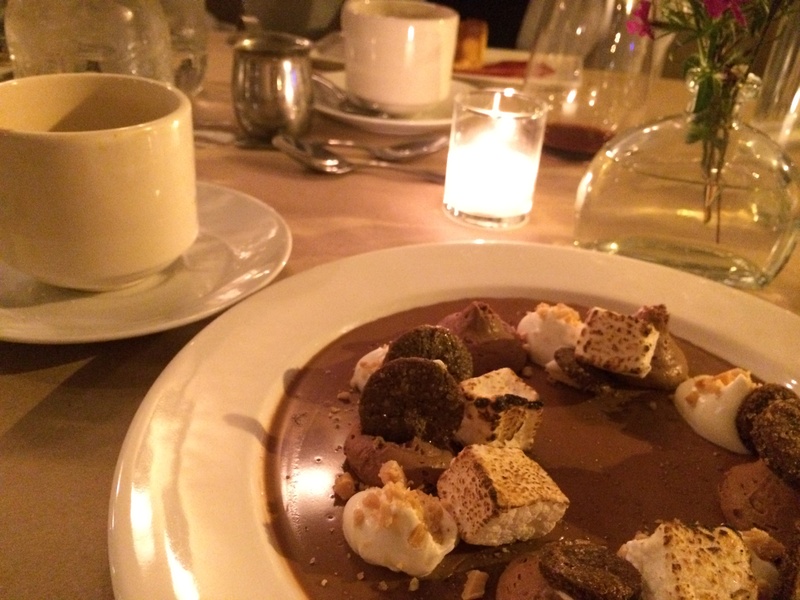 The whip and marshmallow were both phenomenal and cut the richness of the chocolate. For two people who can usually pass on chocolate desserts, this one absolutely rocked our worlds. So that’s it. 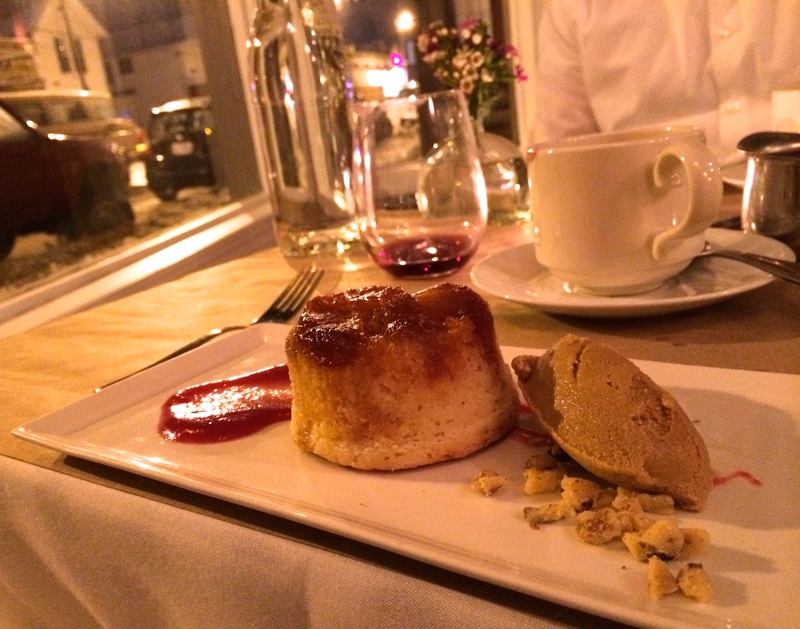 We couldn’t have asked for a better meal; from beginning to sinful end, this was a dining experience that we will not soon forget. I can’t wait to get back up to Spice and discover what they are growing and cooking up next. 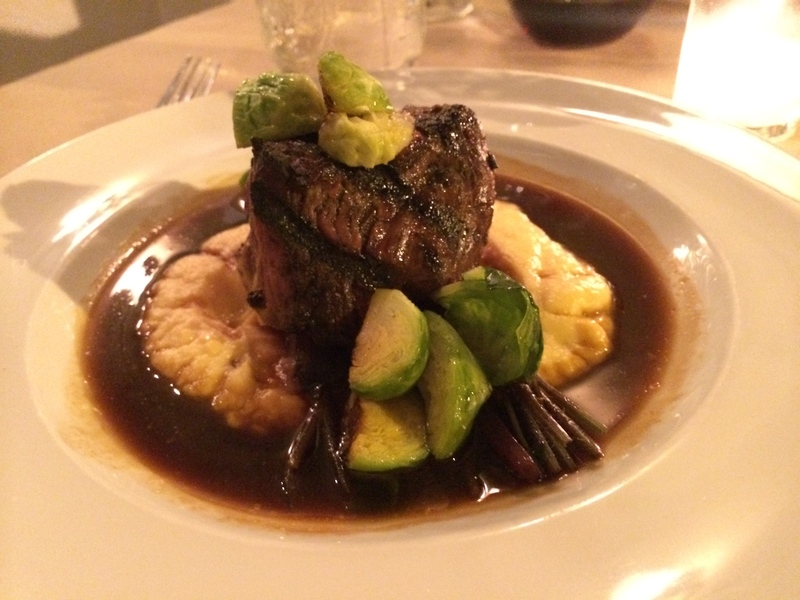 This entry was posted in Cleveland, OH and tagged beef tenderloin, dessert, farm-to-table, local, oysters, salmon, sustainable by Yvette (@foodiedreamer). Bookmark the permalink.